I am over the moon to announce that For the People will be published by Jonathan Ball, publishers of books by Malala Yousafzai, Sir Percy Fitzpatrick and Stephen Hawking, in June 2019. Huge thanks to the team at Harper Collins UK for making it happen. I’ll be heading over to South Africa for the launch – more details to come, so watch this space. On Wednesday 7 June, 2017, Knysna went up in flames. I first found out about it here in New York when I woke up to Facebook posts, pictures and videos from friends mentioning fires around our home town. One friend had posted a report from the local municipality that detailed multiple fires, but they were in areas I’m not all that familiar with, or don’t know at all. Hooggekraal. Springveld. De Hoop. Fires high up in the mountains and in plantations. Fires far from home. But further up my Facebook feed, friends in Knysna were starting to panic. Back roads were being closed. Houses on the outskirts of town were being evacuated. At 9am EST I spoke to my mother, who confirmed the fires were spreading but reassured me their neighbourhood of upper Old Place was out of harm’s way. “Ag, there’s no need for that,” she said. She sent me a few pictures she’d taken of the smoke-filled sky, some from the middle of town, some from the balcony of our family home, overlooking the lagoon. Curious-onlooker pictures. It looked bad, but still distant. But the panic on my Facebook feed spread as fast as the fire. Posts became more frantic as the local authorities closed the N2 on both sides of town, isolating the residents within. Videos showed lines of cars trying to get out against a backdrop of flames and smoke. Friends who, like me, are thousands of miles from home in places like London and Washington and California started begging for information about families they couldn’t get hold of. I called my mother again. This time, she said my father had connected the hose pipe, “just in case.” The fire wasn’t near them yet, but gale-force winds meant it was out of control and helicopters were unable to take off to help. At 2.35pm EST, I got the news that my parents, too, had been evacuated. On their way out, I found out later, they had grabbed my father’s medication, a few sets of underwear and Tess, the cat. Remembering my advice, my mother grabbed their passports too. I had never felt more helpless, or further away from home. In the end, my parents were lucky. Their home survived, despite two houses burning to the ground just a street or two away. But so many others were less fortunate. Hundreds of people in and around Knysna have lost their homes, their businesses, their farms. Five people lost their lives. That number will no doubt go up, as the losses in Knysna’s townships haven’t been accounted for yet. My mother says at least 80 homes burnt down in one township, some of them shacks, some of them brand new RDP houses built as part of the government’s Reconstruction and Development Programme. My heart breaks for everyone in Knysna who’s lost everything, and for everyone in the towns further along the coast as the fire continues to spread. But in the aftermath of this horrific disaster, love, kindness and generosity are spreading too. From all over South Africa, people are coming to Knysna to bring food, clothes, supplies and support. Locals are opening their homes to strangers. Volunteers are going round rescuing pets that got separated from their owners. Knysna’s spirit continues to burn bright. Click here for information on how to contribute to the Knysna relief effort. In 2014, I was invited to contribute an essay to a special Mandela issue of the fantastic South African design magazine, ijusi. It was to be featured, along with back issues of ijusi, in the exhibition Public Intimacy: Art and Other Ordinary Acts in South Africa at the San Francisco Museum of Modern Art (SFMoMA). The assignment terrified me, not only because of the sense of responsibility to pay a fitting tribute to, quite frankly, the greatest human who ever lived, but because I didn’t have a Mandela story to tell. So that’s what I wrote about. A friend who’s just finished reading For the People got in touch to say that my mother “sounds like one helluva lady”. But it also reminded me that many of you who are reading the book won’t know what she looks like. 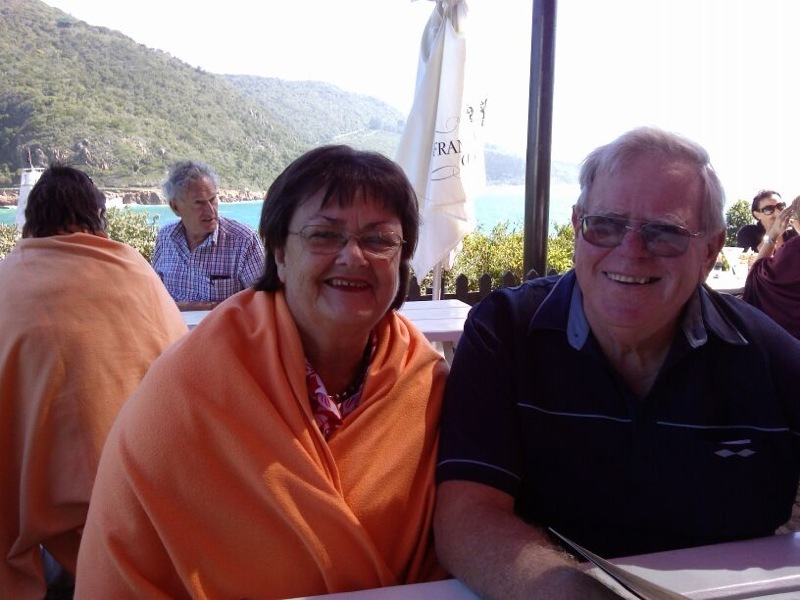 So here, to put some faces to the names, is a picture of her and my dad, taken last year at the East Head Cafe with the Knysna lagoon in the background. Names are a bit of a theme in the book, and I loved finding out the meanings behind some of the African names that I’d grown up hearing: names like Vulindlela (Voo-lin-DLE-la, meaning ‘open the road’) and Thembalethu (Tem-ba-LEH-too, meaning ‘our trust’). My parents’ own names are quite unusual too, even by South African standards. My mother, Owéna (Oh-WEE-na) was expected to be a boy – in which case she would’ve been christened Henry Owen, after her British-born grandfather. When she turned out to be a girl, her parents simply changed it to Henryetta Owéna (to her chagrin in later years). My father, on the other hand, goes by his middle name of Theron (Te-RON), which was his mother’s maiden name – and is now a pretty well-known surname thanks to a certain Charlize. Any family ties to Charlize are, however, sadly unverified. The Knysna-Plett Herald, Knysna’s local newspaper, holds a very special place in my heart. When I was growing up, my brothers and I featured in it every so often; my brothers usually for sport, me usually for piano or cello exam results. My camera-shy mother featured occasionally too, as part of her fundraising efforts for the Knysna Child and Family Welfare Society and later Epilepsy South Africa. Years later when I was doing my research, the Herald became a valuable source of information about Knysna’s apartheid past. Articles and readers’ letters about the national referendum of 1983, which saw coloured and Indian people gain seats in a new ‘tricameral’ parliament – but black people still denied a voice – gave me amazing insight into Knysna’s reaction to those controversial changes. Another article showing my mother accepting a minibus donated by national newspaper Rapport really brought to life the story she’d told me about how she bugged the Rapport people until she got the much-needed vehicle to transport the townships kids to school. And a front-page feature titled ‘Black Pawns in Shock Move’ documented in vivid detail the appalling conditions in the temporary township of Bongani, which some of Knysna’s black people were moved to when their squatter camp got demolished to make way for a wider highway. 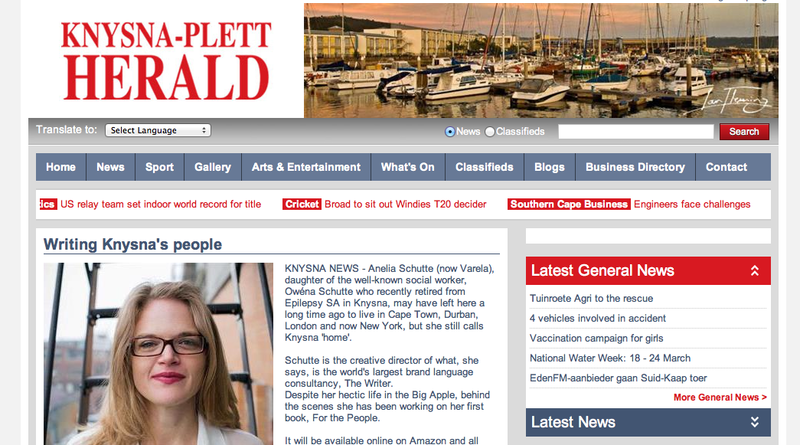 So I’m very proud to be featured in the Knysna-Plett Herald today, interviewed by Anoeschka Von Meck. I’m thrilled to announce that you can now preorder For the People from Amazon’s Kindle Store, for automatic delivery (as if by magic) to your Kindle on 27 February. Here’s the UK link, but you can find it on any Amazon site. When I went back to South Africa to work on this book, I set out to find the truth. And to do that, I knew I had to hear all sides of the story. So I spoke to the ANC powers that be, and the apartheid powers that had been. I spoke to a man whose job it had been to catch black people without the necessary paperwork to live in Knysna, and the women who’d lived in fear of their husbands being caught. I spoke to a mother whose child had been shot dead by the police, and a policeman who’d been there on the night. One man told me he’d been tortured by the police while in custody. Knysna being such a small town, it wasn’t hard to track down the policeman in question. But when I spoke to him, I heard a very different story. What soon became clear was that the truth is a very subjective concept. I shared some of the more conflicting stories with a friend. ‘Who do I believe?’ I asked him. ‘They’re all telling you the truth,’ he said. ‘The truth that they remember. Today I’ve been trawling through hours of video footage of interviews and dozens of photographs that will become the trailer for my book. The photos brought back many memories from when I was little. Most of them were taken in the 1980s by my mother, who used them for slide shows (using an old-school slide carousel) to help her make a case for funding for better facilities in the squatter camps. And by ‘facilities’ I mean things a simple as a single water tap to serve an entire community, who had no running water, electricity or sewage facilities at the time. 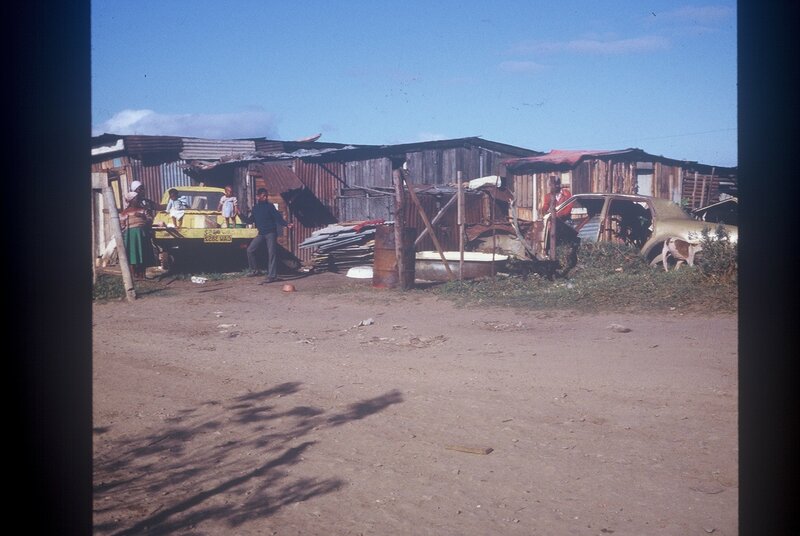 A typical scene from Knysna’s squatter camps in the 1980s. Sadly, there are still some houses that look like these. 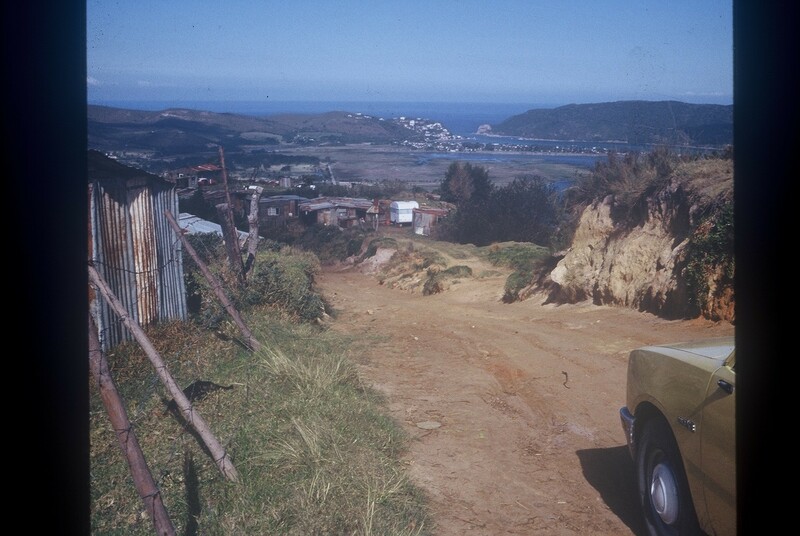 Driving into one of the squatter camps in the Child Welfare ‘bakkie’ (pickup), with the Knysna Lagoon and the ‘white’ town in the distance. 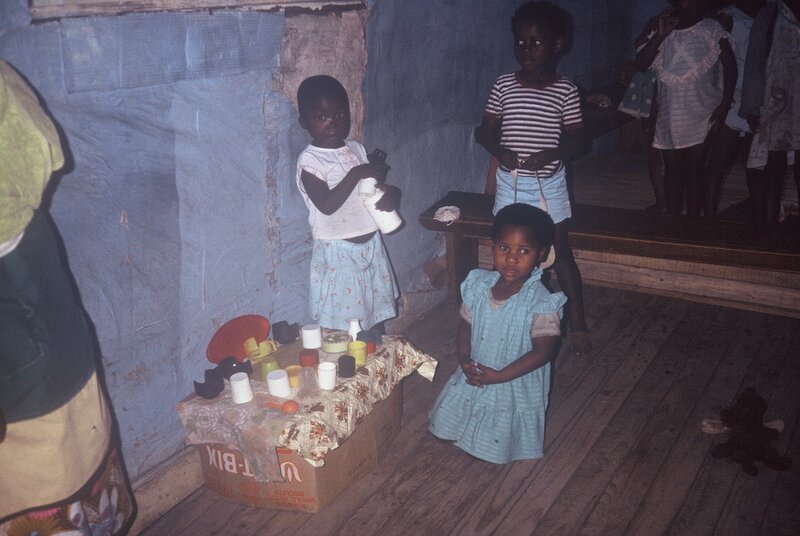 Children playing at one of the creches my mother started with her colleague Paula Whitney.